Charlotte Rep's production of Art. A few years ago, some friends of mine in Los Angeles had a huge falling out. The fight was over a dining room table. A piece of furniture ruined their friendship. The story goes like this: Jody and Sarah lived in Silver Lake, and their friend Gwen lived out at the beach, in Pacific Palisades. Jody and Sarah had a funky little flat, filled with all kinds of cool collectibles. Gwen, who is a well-paid lawyer, had just moved to a swanky high-rise apartment with ocean views. She didn’t have much stuff, so when her family came for the holidays and she didn’t yet have a table, she rented one. She rented a dining room table, because it was an easy solution and she could afford it. Her good friends were incensed. They told her in absolute terms that she was wasteful and shallow - their anger was white-hot and righteous, and nothing Gwen said could make them back off. Everyone said terrible things. When I last saw them, they still weren’t talking to one another. Seeing Charlotte Rep’s production of Art reminded me of these three friends, and of how something, seemingly a small thing, can become the rationale for an abiding disagreement. The characters in Art - Marc, Serge, and Yvan - have known each other for ages, and it would seem like their habits of friendship have the mark of permanence. But then Serge’s purchase of an expensive painting sparks a firestorm of disapproval and dissatisfaction Is it the painting itself or how much Serge paid for it that so infuriates Marc? Yvan tries to placate them both, but that tactic completely backfires. All the petty and trivial flaws in the friendship plop down like cards on a table, and the viciously funny game begins. Yasmina Reza’s play opened on Broadway in March of 1998 and ran through August of the next year. Its original cast was Alan Alda, Victor Garber, and Alfred Molina. That production won the Tony for Best Play of 1998. Alfred Molina, who played Yvan, was nominated as best actor, and the director, Matthew Warchus, was also nominated. The original French production, which opened in 1994, won the Molière Award for Best Play, Best Production, and Best Author. The play has been widely translated and produced all over the world. It’s a thought-provoking piece. The Rep’s production features Steve Brady, Allen Edwards, and Martin Thompson. 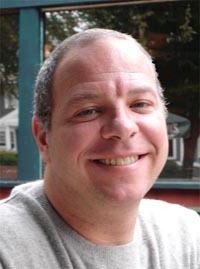 Director Dave Mowers has worked for Charlotte Rep before. He directed Charlotte Rep’s 2002 production of Fully Committed. I had lunch with him just after Art opened, and asked him what brought him here. I’d worked with Michael Bush at Manhattan Theatre Club, and he invited me down to do Fully Committed. That was great. We had a really talented local actor, Scott Helm. Scott gave the performance of a lifetime. I had a really good experience, and I worked well with the local creative team, and they knew that I was good on comedy and got along here at the theatre. I know I got a good recommendation from Scott. Terry Loughlin and I had a couple of long talks about the play, and then he offered me the job. How long have you been in New York? This is my tenth year there. I began as an actor. I went to college in Los Angeles and graduate school in London. I knew I wasn’t going to stay in California. My real love is the theatre, and L.A is not a theatre town. When did you segue from acting to directing? Really early in my career. I was so often cast as the brother or the neighbor - small parts. There’s no such thing as a bad part, but I realized that small parts were going to be my career. Even in graduate school, my teachers all told me that I had a director’s eye. Maybe that was a nice way to say that I wasn’t ever going to play the lead. I was an actor for six or seven years after graduate school. Lots of actors make money teaching, and while I was teaching I tried directing and found out I was good at it and really liked it. Tell me about your work in Norway. Every summer, I direct Shakespeare for Thesbitheateret, Norway’s National Theatre. I didn’t know a word of Norwegian when I arrived. At first, it was like directing opera. I had the English lines on top and the Norwegian lines below, and just followed along. After being there a few summers, though, I’m fairly conversant. Are the Norwegian translations of Shakespeare modernized to suit that language? It depends on who the translator is. They have a beautiful set of translations by André Bjerke, who is also their greatest twentieth century poet. His translations are specific and poetic, and make the language gorgeous. Norwegian is an old and impoverished language, because they were a subject people for so many generations. The language is sort of coarse and simple. It naturally fits better with the low comedies. The more contemporary translators don’t follow the beauty of Shakespearean language as well as Bjerke does. Do you tend to do more modern or traditional productions in Norway? What’s your taste? I’d say I’ve done about fifty-fifty. It depends on the play, and what I want to achieve. The setting in Norway is a giant amphitheatre in a rock quarry, so it takes modern things in a very specific way. You have to be careful about what you put in the middle of a rock quarry. I grew up watching Shakespeare on an Elizabethan-style stage, or at Shakespeare festivals, so all of my design choices and most of the way I think about Shakespeare is that experience somehow translated into the setting. I’ve done a starkly modern Romeo and Juliet, and a beautiful period production of Much Ado About Nothing. The Thesbitheateret design staff is really great. They can make whatever I want. Let’s talk about Chink-O-Rama. How did you and Kate Rigg start working together? Kate is a brilliant, multitalented soon-to-be discovered star. We first met when I directed a workshop of a musical she wrote with her musical theatre writing partner from Julliard. We did it at Manhattan Theatre Club. Her writing is really lively, and has this great contemporary voice to it. I asked her if she had anything else, and she had some stuff that was Chink-O-Rama, so we started putting that together. Since then, we’ve done two other full length projects together. How big a thing is Chink-O-Rama? Tell me a little bit about it. There are four or five Chink-O-Rama dancers, and they have amazing, sort of Solid Gold choreography, with huge, hilarious costume changes. They dance a dozen numbers, and there’s sketch comedy and monologues interlaced. Kate has a male counterpoint called Chink Daddy. His real name is David Jung, and he recently won the World’s Championship Air Guitar. That got him on Conan, and Leno, and Letterman. Chink-O-Rama happens in front of three Hello Kitty shower curtains. At Joe’s Pub, we have a big rock and roll light show. Sometimes, on the road, it’s a little simpler than that, but basically it’s just Kate and the girls coming down center and being really funny. It seems, from reading about it, to be a lot about bad puns. It’s not just about that. It has a lot of bad puns in it, and there’s a lot of parody, but it’s a really important and interesting message. As an actress, Kate is of indeterminate race. She was graduated from Julliard, a fine actress with an amazing pedigree, and found herself going out for the Mexican whores and Indian slaves because she’s generally ethnic. Taken as a whole, the pieces in Chink-O-Rama explore what Americans think of Asians. How we view the continent... what the differences are and why people don’t see the differences. It’s also about the Asian American immigrant experience. What it’s like to be "post- Asian." There’s a whole generation of people now who are born and raised here by people who are already assimilated. They’re just Americans. So, what does it mean to be an Asian American? Kate really grapples with these things in a hilarious way. The Chink-O-Rama dancers are in Los Angeles. Chink Daddy is in Toronto. Kate is back and forth between New York and L.A., so this year we’ll probably do very select dates in New York. Let’s talk about Art. There’s such silliness to the arguments. It seems very French. That's good. It’s a French play. What I like most is that the play is about three men in middle age. It’s a chance to see three men that really care about each other, and to see what kinds of jealousies and rivalries are there - what they want from each other, and how they support one another. I see the painting as a catalyst, a vehicle for talking about other things. The argument about what makes art modern, or good, is the least of it. The interest lies in knowing why grown men treat each other that way. I’d like to talk a bit about Marc’s anger, if you don’t think it’s giving away too much. Do you think he really does realize it’s a great painting, and just resents that Serge bought it without talking to him? Or does he just not get it? It’s up to every actor to decide that for himself. I don’t think that Marc acknowledges that it’s a great painting, or can see that it has any value at all. I think at the very end he can finally say that the canvas represents something, and until then, to him, it’s just white paint on a canvas. It’s only after a very emotional exchange with his friends that he’s able to look at this work of art and pull something out of it about his own life. He sees that the painting is about the journey of someone who has disappeared. I think the hopeful journey of the play is that, at great cost, Marc has learned to appreciate art. Some critics have said that Yasmina Reza, who has written what’s regarded as a comedy, has a bitter outlook. What do you think of that? Do you think her characters are bitter? That’s a terrific question. I wonder if those were American or European critics. I don’t think the play has a particularly happy ending, and Americans tend to want plays to end on a hopeful note. I don’t think Yasmina Reza is very invested in that. Her plays have a deep and adult sadness to them. She writes about relationships that are breaking, about problems that cannot be solved. There’s a great deal of wisdom in her plays, and there’s a lot of anger in her work as well. I guess that could be read as bitterness, but I read it as maturity. There are some things you just can’t fix. Watching men realize this in a play is rare. The way men usually deal with each other as friends is to validate each other in simple ways, like they’re a team. When they realize that their choices and the things they appreciate have diverged, there isn’t necessarily a way to resolve their differences. Marc can’t play the game. He can’t say, "I see what you see." In this play, we can watch the characters move past the friendship they’ve taken for granted, move to something more complex and more difficult. There’s something great about acknowledging that kind of sadness and anger and turning it into humor. I think the play is really funny. It takes these small issues and blows them up to the point where friendships are at stake. I think we do that to people all the time. It’s never the big issue; it’s the broken shoelace. "I shot her because the meatloaf was bad." "I finally left him because he won’t pick up his socks." I think that’s so recognizable. And I have to say, I have three really great actors on that stage. Audiences really respond to them, and I’ve so enjoyed working with them.